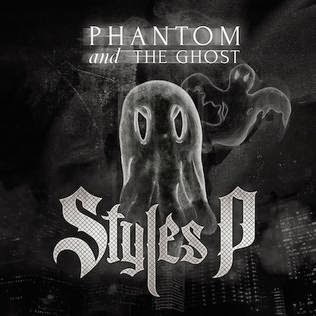 Wayne's Hip Hop Blog : A brief review of Styles P's "The Phantom and The Ghost"
A brief review of Styles P's "The Phantom and The Ghost"
On the solo (album) tip, the Lox's Styles P is the most consistent, and he returns with his 7th album. This Joe Milly produced banger gets the album started off on the right note. It's about what you would expect from Styles P, and it's definitely dope. When SP is by himself, what you hear is what you get. "Other Side" (featuring Shae Lawrence, produced by Maxpayne Shawty) is such an uplifting song. Any time we get a song telling us to stand strong through it all, it's usually a winner in my book, and in SP's case, this is the album's best song. The apply titled "Deeper Self" (produced by Buda Da Future & Grandz Muzik) is also very good with its introspective vibes. As usual on a Lox release, the guests largely come through. The Sheek Louch assisted "Creep City" (produced by Black Saun) is the most aggressive song on the album, and at this point Sheek does a good job bringing out that side of SP, we get a Y.O./Harlem connection with the underrated Vado on "World Tour" (produced by Joe Milly and Mr. Devine) and it's nice, especially with it's 2014 update on A Tribe Called Quest's classic "Award Tour", "Don't Be Scared" (featuring The Bull Pen, produced by Vinny Idol) is hard as you would expect, another apply titled song in "Never Trust" (produced by Black Saun) is good. It is here where the mostly solid material on this album sadly ends. Oh man, "Sour" (featuring Jadakiss and Rocko, produced by Knucklehead) is a song I did not care for at all. It's a little too Southern styled, and you can apply that to all three verses and the beat, and it sounds like something you would hear on the radio today, for all the wrong reasons and it comes off as being out of place on this album. "For The Best" (produced by Harry Fraud) is good lyrically, but would've been much more effective with a better beat, and while the smokers should like "Smoke All Day" (featuring Dyce Payne, produced by Daysel), it's nothing we haven't heard before. Coming off of 2013's awesome "Float", this album, while solid in spots, is a step down, and for some reason, it gave me a mixtape vibe throughout. Of course it doesn't break new ground lyrically (SP can still bring it), but I feel what weighs this album down a bit is the production. Granted, it's commendable that he gives a good number of new cats some shine, but Scram Jones, just to name one producer, presence was missed on this one, and had he provided some tracks, things would've been a little different. Overall, I'll go with a 3.5 star rating, with a slight recommendation. 4.5 stars, his best album. About 4.5 stars, plus this is due for a revisit. 4 stars, his most underrated album. 4.5 stars. This may not be in the 3rd spot, but that may change over time. Then again, I doubt it, lol. 4 stars. This is likely one of the dopest Styles P albums you probably never heard.